AC Hotel Milano features the large-scale rehabilitation of the tower of one of the citys most important buildings and is located right in the financial centre and business district of Milan at a stone’s throw from the up-market fashion boutiques, leaders of international fashion trends, and some of the most reputable art galleries. 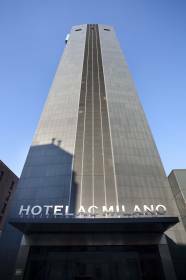 Our Milan hotel is an impressive, modern hotel with 17 floors and 158 bedrooms offering a menu of services that provide you comfort, pleasure and relaxation, beyond any expectations: Safety-box at the front desk, Free mini bar, 24 hour room service, WiFi internet system, restaurant. Meeting room available to hold business meetings and ceremonies of all kinds.Four meeting rooms with dimensions starting at 24 m2 for the smallest, up to 105 m2 for the largest.Business Facilities service for computer equipment hire, translation and contracting hostesses.